Giving a homemade gift basket allows you to choose the contents of the basket and tailor your gift to the recipient's tastes and interests. Gift baskets are also popular group gifts, as you can choose a theme and ask everyone to contribute a small item or chip in for larger items. The more people who go in on the basket, the more you can expand on your theme. Gift baskets also work well for silent auctions and fundraising. Instead of using a basket, cover a cardboard box with red and white striped paper to look like a popcorn box. Line the box with white or yellow tissue paper to look like “popcorn.” Fill the box with DVDs, packages of microwave popcorn, flavored salts and boxes of candy. Fill in empty spaces with empty cardboard popcorn boxes. To make it a larger gift, include a popcorn maker with a bag of kernels and flavored oil. Toss in gift certificates to a local movie theater or a gift card to a movie-rental store. Wrap the basket in yellow or clear cellophane. Use a basket with a thick weave, as candles can be heavy, and a thicker weave offers more support. Choose one dominant scent to build your basket theme around. For example, if you pick apple pie scent, use red or scarlet tissue paper to line the basket. After lining the basket, add candles of various sizes, a candle lighter, a candle plate and a few decorative candle lids, which sit on top of the candles to make them burn evenly. To add to your gift, include a gift card to a candle shop. For an even larger gift, include a make-your-own-candle kit with all of the ingredients. Use a picnic basket or other lidded basket for a game theme. Any color combination of bright tissue paper works well for this theme. Put one or two board games in the basket. Add card games, bingo cards and markers, writing utensils and extra dice. Ideas for larger items include a special edition of a board game or a poker set. Include extra score sheets for any of the games that require them; these are usually sold near the board games at toy stores or department stores. 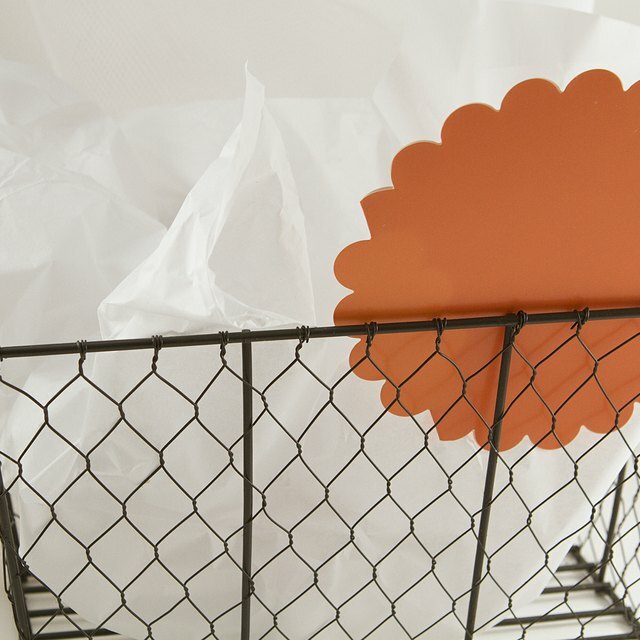 A lidded basket works best to keep all of the supplies inside and organized. For a general art-supply basket, include drawing pads, pencils, paint, clay, rulers, glue, felt and stickers. 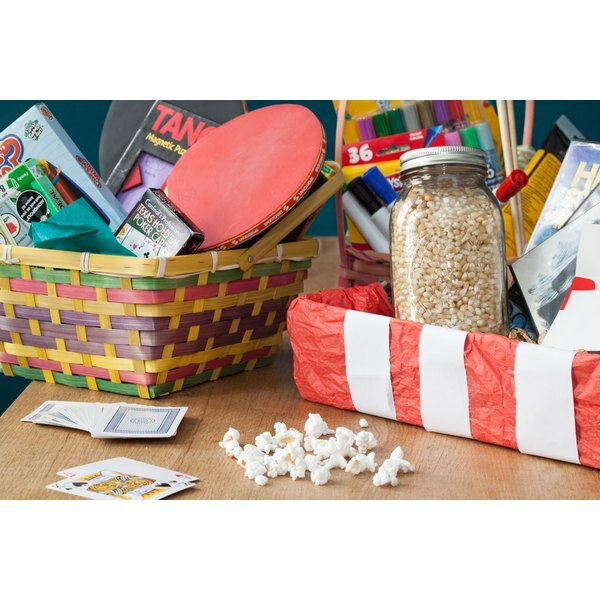 Alternatively, you can put together a basket for a particular type of crafting, such as scrapbooking, or make a basket with supplies and instructions to complete a specific project. Add a gift card to an art-supply store.